Four billion people — or two out of every three on the planet — do not have enough water to meet their basic needs. That is far greater than previously understood, according to a new study that presents a more accurate picture of the problem. Water scarcity is fueled by population growth, consumption habits and demands from agriculture. Its impact is evident on the landscape, said Arjen Hoekstra, a professor of water management at the University of Twente in the Netherlands and co-author of the new study in the journal Science Advances. "Groundwater levels decline and lakes disappear,” Hoekstra said. “You have less water flowing in the rivers. This threatens ecosystems and biodiversity, and harms local downstream communities where water will not flow." 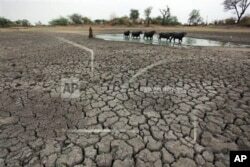 FILE - Livestock find water on parched land in India, July 15, 2014. Half of the four billion people faced with water scarcity live in China and India. Unlike previous studies, this work compares consumption to available water on a monthly rather than annual basis from around the world. In their models, researchers included data on climate, land use, soils, crop growth, irrigation, population densities and industry. The study finds that the situation affects many more than the 1.7 to 3 billion people previously estimated. China and India account for approximately half of the four billion reported in the study. Hoekstra said the problem is widespread, with critical shortages also in Mexico, North Africa, South Africa, the Middle East and the American West. "We have a much more accurate picture from all those places," he said. "The data shows us precisely when the scarcity occurs and for what reason." Hoekstra said the study creates a new baseline for policymakers. "Governments need to set a water cap for every month so they don't allow more water use than water available, and people must become more aware of how much water is being used for everything they consume," Hoekstra said. FILE - A villager in Tanshan, nestled among brown hills in central China's Ningxia region, walks to a well to fetch water Feb. 17, 2003. Consumer awareness also helps, he added, explaining, "Consumers can make choices based on the amount of water used for making their products. And if they consume less meat, for example, it will really save a lot of water." Hoekstra said the key is to use water more sustainably, a mandate that ranks high on the international agenda. "The World Economic Forum names water scarcity — together with climate change — as the highest priority of environmental concern. It is the biggest risk to the global economy," he said. Hoekstra adds that governments should put a price on water resources and allocate those resources more wisely. He hopes the new data will lead to action to reduce water scarcity, taking into account how to use water more efficiently, how to consume water more sustainably and how, by changing our habits as consumers, we can make a real difference.